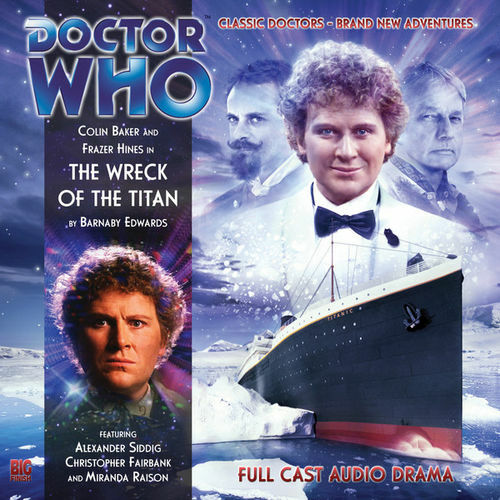 One would be forgiven for thinking that ‘The Wreck of the Titan’ is Doctor Who’s take on the sinking of the Titanic after a brief look at the release’s cover art and blurb. While that fateful event does spur on events at the end of the first episode, writer Barnaby Edwards instead offers a cinematic tale that is altogether more interesting and satisfying as it deftly continues on from ‘City of Spires’ while reaching much farther back into the Doctor’s personal history. It seems quite fitting that the Doctor would want to make Jamie’s first official trip in the TARDIS a memorable one, and the blindfold is a nice touch as he tries to add a feeling of spectacle and wonder. The Doctor is rather delighted to inform his once-again companion that they have landed on the Queen Mary in 1946, but Jamie bluntly contradicts him and shows him that they are, in fact on the Titanic in 1912. With nothing fixed or certain, the entire first episode delightfully plays with an uneasy sense of the unknown, and the Doctor even begins to think that they are in some type of tourist attraction that re-enacts famous disasters, alluding to ‘Carnival of Monsters’ as events progress. Suddenly faced with the existence of two ships sharing similar fates, the Doctor must admit that he is wrong and next posits that a temporal fissure must have formed. However, the Doctor’s belief that Jamie has sunk along with the Titan allows Colin Baker to imbue the story with an incredible amount of melancholy and drama as the Doctor’s plans to relive the glory days suddenly turn into something altogether more heartbreaking. Jamie, of course, does survive, and a neat change in perspective allows his story to be told naturally, but the reunion of the two leads later on once more reinforces just how much these two characters care for each other even with Jamie’s memory gap. While the theory about the temporal fissure and the ensuing one about being trapped in a computer game or simulation are ultimately proven false, the final revelation is absolutely earned and resoundingly successful. The sudden shift from being on the Titanic to the Titan, the lower deck’s doors opening up to nothingness, the repetitive music and reactions, and the Nautilus from 20,000 Leagues Under the Sea all seem strange and quirky as events unfold, but they all make perfect sense when the Doctor finally pieces together the fact that they are once more trapped in The Land of Fiction. Jamie had wondered if somebody had read some books and created their own version of events before the thought even entered the Doctor’s mind, but he fleshes out that concept as he recognizes that events are following many novelized plots and involving anachronistic characters and that the mysterious black liquid that seems so important is actually ink from the Architeuthidae squid. Though there certainly are still plenty of questions left for the upcoming ‘Legend of the Cybermen’ to answer, the journey through and conclusion to ‘The Wreck of the Titan’ are absolutely spellbinding. Edwards’s script brings plenty of literary and accurate detail with it, but its sense of unpredictability and intrigue along with its sparkling dialogue ensure that the audience’s attention is gripped from ambiguous beginning to dynamo ending. Alexander Siddig, Miranda Raison, Matt Addis, and Christopher Fairbank all offer strong performances in support, helping to complete a story that features the very best of creative writing and direction that never loses sight of its nautical theme as events continually get more extraordinary.